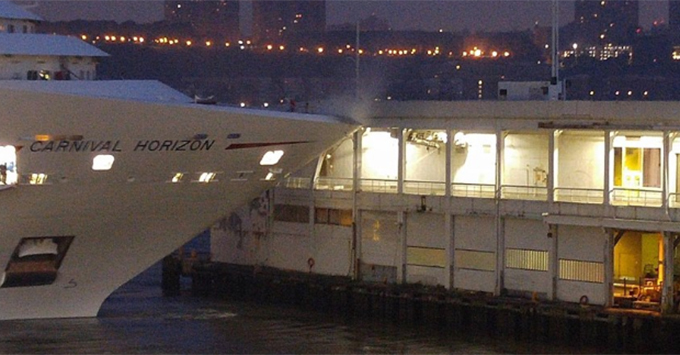 (5:45 p.m. EDT) -- While docking in New York City this morning, Carnival Cruise Line's newest ship, Carnival Horizon, struck the west end of Manhattan Terminal's Pier 90. No injuries were reported, and there was little damage to the ship itself -- giving it the OK to depart tonight as scheduled, for its next sailing. In a statement, Carnival described the impact to the ship's bow as minor. It added: "Assessments of the pier are currently underway. The U.S. Coast Guard and other authorities have been notified. There has been no impact to our debarkation process this morning, and embarkation for today’s sailing proceeded as normal." The ship damaged two metal support beams and part of the parking level on the pier, according to the FDNY and a spokesman for the city's Department of Buildings in an NBC News report. Carnival Horizon was returning from an eight-night Eastern Caribbean cruise that departed from New York on August 20. The ship, which debuted in April 2018, is nearing the end of its maiden season in New York; it will reposition to its new homeport of Miami in late September. On the Cruise Critic Boards, member shof515 -- who shared the above image -- posted to the Carnival forum: "This is a known issue with the Manhattan terminal and long, bigger ships always [have] a close call with making that tight 90 degree turn into the terminal. "NYC is my homeport, and I always sail out of this terminal. I [have] seen more than a dozen close calls with ships trying to pull into this terminal." This is not the first time a cruise ship has come in contact with a dock. Just this past April, an MSC Cruises ship collided with a pier in Roatan, Honduras. In summer 2016, a Celebrity Cruises ship also hit a dock in Alaska.